I was recently invited to attend the Pairings at the Point event which showcased pairings of food and booze at Thompson’s Point. It’s hard to turn down an offer to stay fed and hydrated, so I gladly accepted and was looking forward to reporting on the shindig even if it was on a Sunday during a Patriots game. Put on by Cellar Door Winery, we arrived with the expectation that it was actually occurring at the winery, but were pointed in the direction of the Thompson’s Point event space by a sign sitting outside. As we walked toward it, we saw that it was taking place under a giant, enclosed tent. 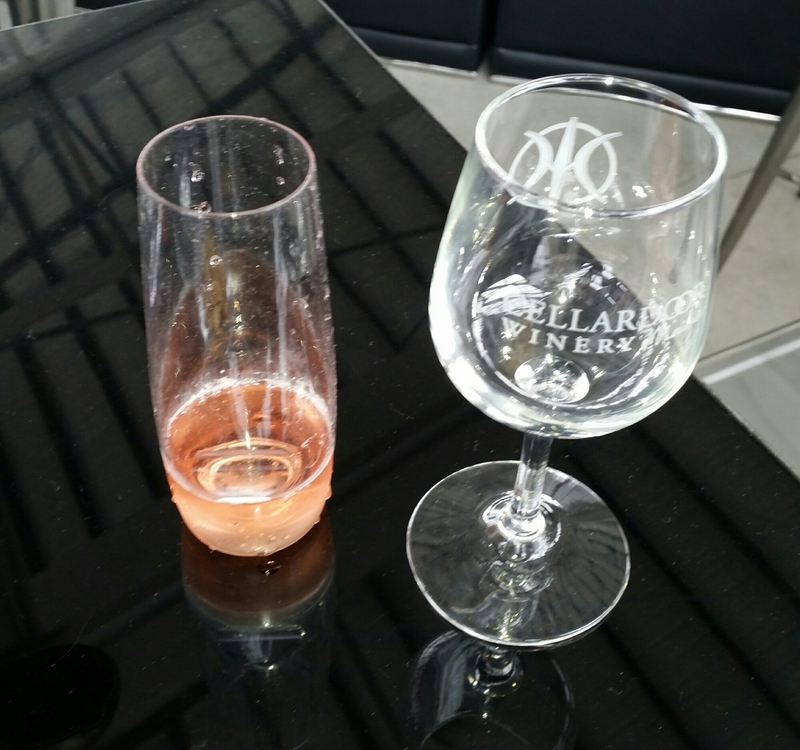 We made our way into the tent, walking through a long corridor and checking in, and then getting a Cellar Door branded wine glass each with which to obtain some of the wet goods inside. When we finally entered the actual event portion of the tent, the large room was not exactly what we expected. The center had lots of cozy seating and cute tables. There was a small stage with a DJ playing music which happened to be all TV show theme songs when we first arrived. Along the outside edges of the enclosure were five food and drink pairing tables which seemed to start to the left of the entrance and go clockwise according to the natural progression of a meal. After taking a some pictures, we we made our way to the first table, which was full of oysters and champagne on ice in addition to some potato chips which weren’t on ice. My disdain for raw seafood is well documented and I skipped by the oysters, grabbing a couple glasses of bubbly while my wife took a plate of chips for us to share. We sat and I drank some pink champagne while she drank the standard version. It wasn’t a crazy start for us, but a little sipping and chipping gave us a few minutes to observe what was going on and check out the people and happenings around us. The next table we visited was the White Wine Station. Since I was driving, I chose only a half pour of the 2013 Chardonnay to start and went on a food gathering spree. First I took a Mini Lobster Roll with Tarragon and Dill. From a meat and cheese tray, I made myself an open-faced sandwich of bread, prosciutto, marinated cheese, and pepper jelly. Then I grabbed a little boat of Green Papaya Salad with Peanuts and another with Crispy Calamari with Lemon. Mrs. Portlandeater snagged some food and wine too and we headed back to the table to relax and sample the goods. A taste of everything brought a joy to my soul. The lobster roll was particularly delicious with the herbs, though admittedly, they could have done most anything with the salty sea bug and I would have been happy. I’m always a sucker for a bit of pork and cheese, and I was thrilled with the exceptional crisp from the squid as was my wife. The papaya salad was lighter fare with veggies, vinegar, and spice. It offered a nice, fresh crunch in every bite. Overall, the seafood items were certainly the best, but everything was pleasant, and while white wine isn’t usually my vino of choice, it was a nice compliment to the food. Next up, of course, was the red wine station. I requested a small portion of the 2012 Dolcetto, a wine that was new to me. Mrs. Portlandeater went with the same and we both went across the table, grabbing some food. 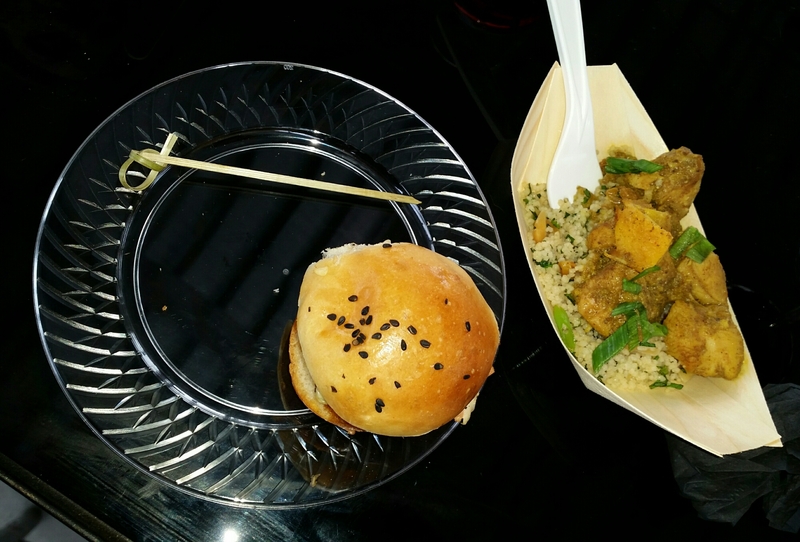 I started with Brisket Sliders with Slaw, then Moroccan Chicken with spiced couscous, and finally Lentil and Greens Bruschetta with Ricotta Salata. I left behind the Rosemary-Lamb Lollipops with Salsa Verde as there was still a lot of food left to try and it just wasn’t going to be a lamb day for me. The wine was a nice, smooth red and I enjoyed the pairing most with the chicken, which contained some citrus and almond. There’s no doubt the reds go well with meats and the well-spiced chicken and beef slider were where it was at with the dolcetto. The bruschetta wasn’t my style, but it was worth a shot to find that out. The food was a little heavier here, the wine a little bolder, and the combination was a satisfying grape and grub grouping. We took our time with the food and drink, knowing there was more in store for us when we were done. Station four had beer and liquor. 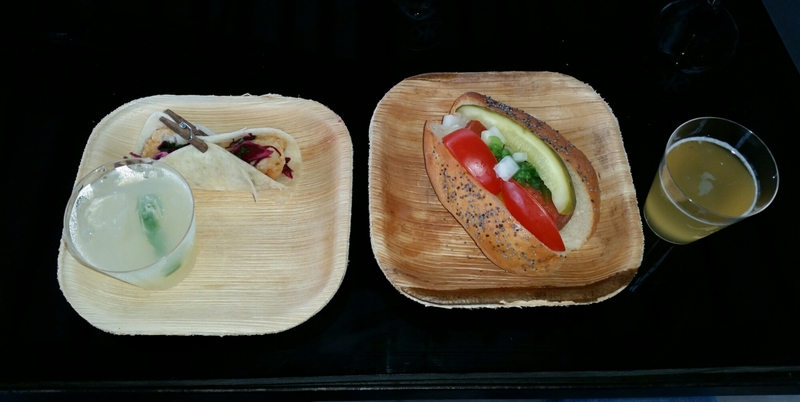 First up was a Chicago Dog and Oxbow Howie. After that came the Maple Glazed Pork Belly Skewers w/ Stroudwater Distillery Bourbon and Rye. I stopped there for the time being and went back to the table to eat it. Mrs. P stuck with finishing her red wine and I started consuming. The dogs were good with tomato, onion, pickle, and relish, and the Howie was a worthy local brew. The maple pork belly wasn’t something I would eat every day. 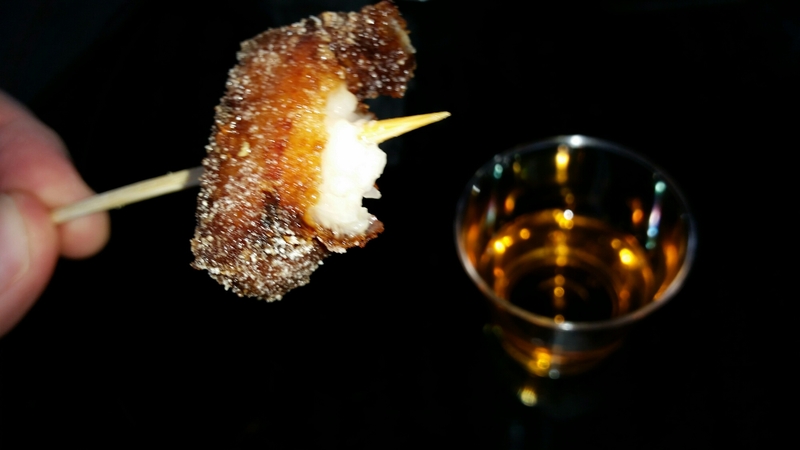 Frankly, The standalone pork belly would normally have struck me as somewhat unsavory, but the crispy maple-flavored fat wasn’t so bad and the maple and whiskey pairing was a definite win. I ate and enjoyed it, slightly disgusted with myself. Once I was out of food, I headed back for more. 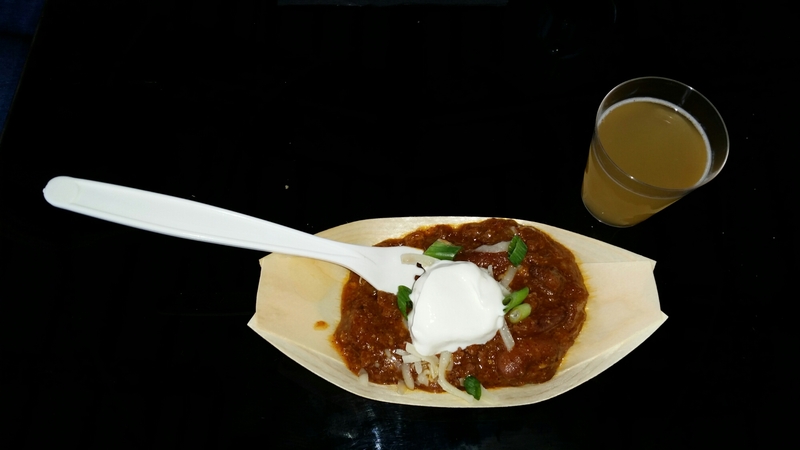 I took a Chili with Sharp Cheddar, Red Onion, and Sour Cream which was served with Oxbow Farmhouse Pale Ale. The last item at that station was Fish Taco with Crema and Slaw and Maguey Mezcal Margaritas. With my hands full, I once again made my way back to our table. I spooned some of the chili into my mouth and found it to be exceptional. The hearty, hot chili had a tiny bit of sweetness and was full of flavor. I enjoyed it with the ale. Moving to the taco, I found the fish fresh, the crema was a tasty accompaniment, and the red cabbage slaw added some texture. The margarita was smokey with the mezcal, but a nice take on the standard tequila tea. 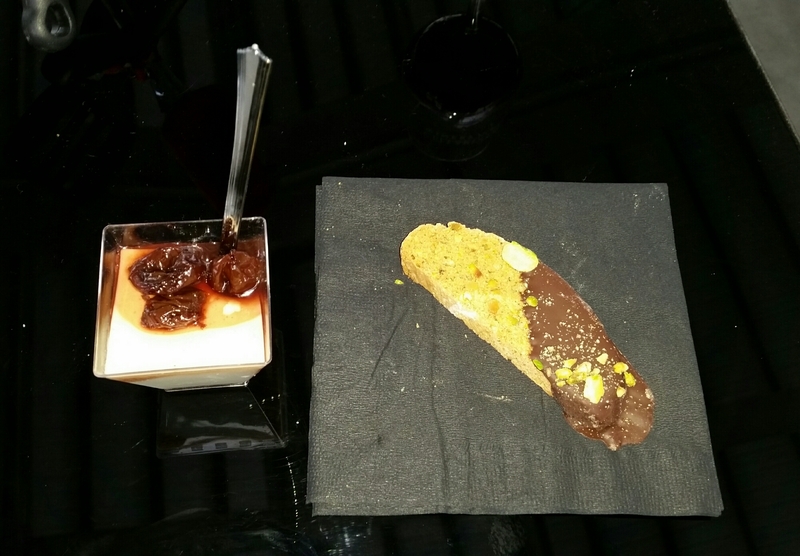 Nearly at the end of the line, we paid a visit to the last spread – the dessert wine station. I went with the 2013 Treasure – a wild Maine blueberry wine infused with Maine maple syrup and fortified with brandy. I passed on the Fourme D’Ambert Bleu on Brazen Baking Crackers, but happily dove for both the Chocolate Dipped Biscotti with Pistachios and Cardamom and the Goat Cheese Pannacotta with C’est De L’or Cherries. C’est De L’or was actually the other dessert wine available. My wife only took a pannacotta. Starting with the pannacotta, I took a spoonful of the soft, creamy custard. It was magnificent. Rich with a dense flavor of cheese, it was easy to eat and a wonderful finishing touch. With the addition of the soaked cherry and sweet blueberry wine, it was a masterful combination. After the pannacotta was done, I bit into the biscotti. It was better than I expected. Sometimes I find biscotti a bit dry and I suppose this might have been, but it wasn’t noticeable, because I couldn’t get past the awesome flavors. Every part of it stood out – nutty almond, chocolate, pistachio, and a little Indian spice. I was pleasantly surprised. As my wife was finishing her dessert and margaritas, I went and got one more lobster roll for good measure. I didn’t want the lobsters to think I didn’t like them, because I sure did. I cut through that quickly, she finished her drinks, and we left to go relax at home. It had been a nice time at a nice event. We considered that the set up allows you to take a comfortable space and make it yours, and then at your own pace enjoy as much or as little as you want from what they have to offer. 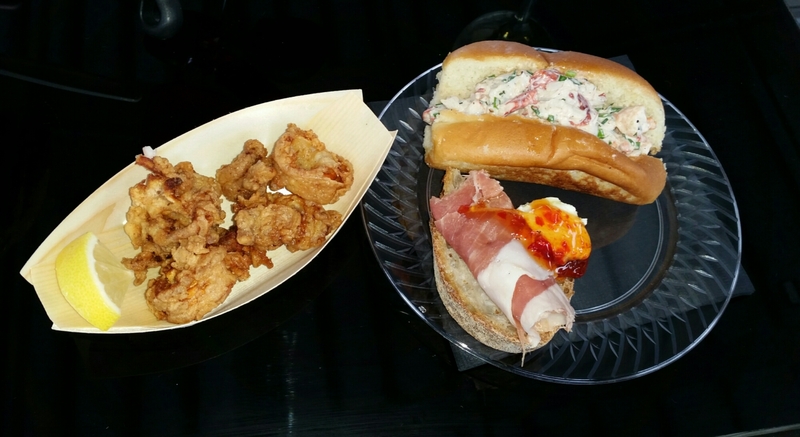 Everything is served in a small portion so you can try it all without getting too full or you can go berserk and have 82 lobster rolls if that makes you happy. The pairings were quite well done and I felt that that overall, the whiskey/pork belly and dessert wine/pannacotta combos were the best, but the others certainly were all certainly more than worthy of a sampling. The one change I would love to see for next time would be to have the pairing event on a Saturday evening where guests can really make a night out of it and maybe indulge a little more than a Sunday afternoon allows. I thought the concept was great and enjoyed it quite a bit, but eating and especially drinking to my heart’s content pairs really well with a night on which I don’t have to work the next day. Either way, it was fun, delicious, and a great opportunity to enjoy some excellent food and drink combos that were new to me and some that I had been lucky enough to try previously. Who can argue with that? This entry was posted in Portland, ME food on October 20, 2016 by peterpeterportlandeater.